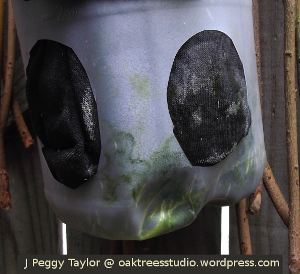 My air-pruning plant pot project is continuing to make good progress. 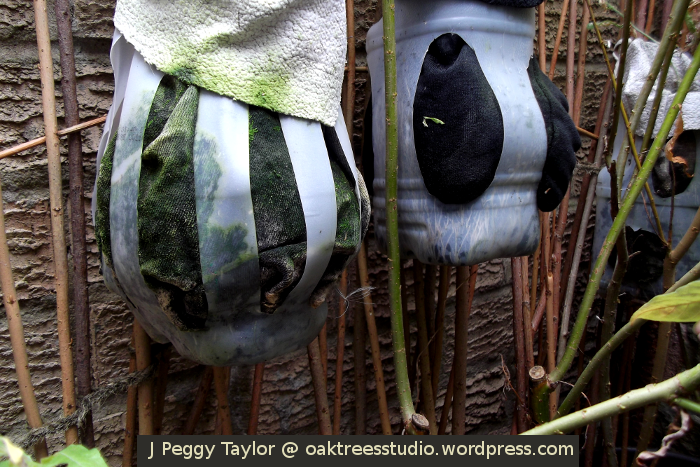 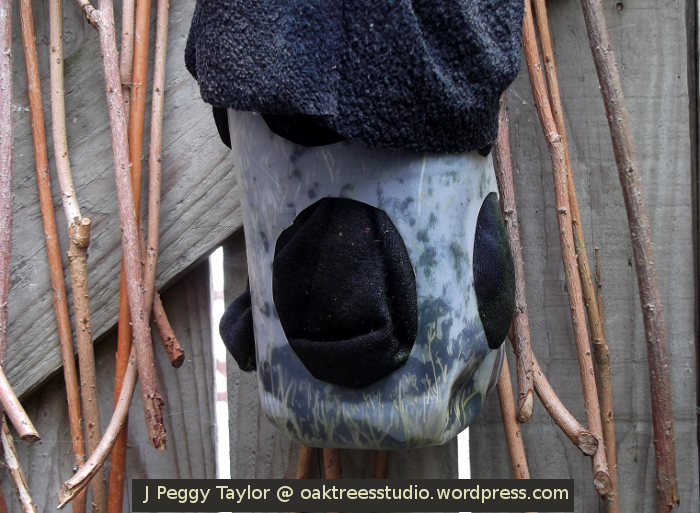 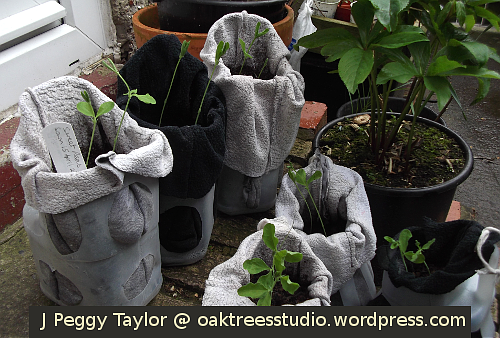 In my last post I’d added some upcycled fabric grow-bags to the upcycled plant pots I’d created from milk cartons. 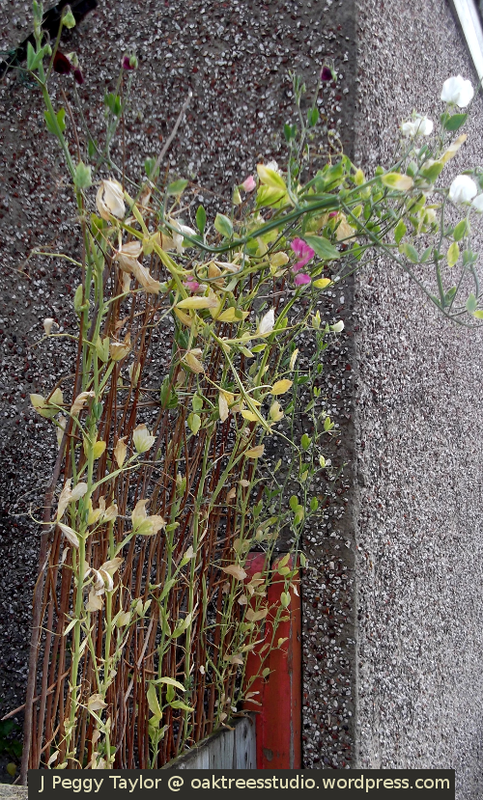 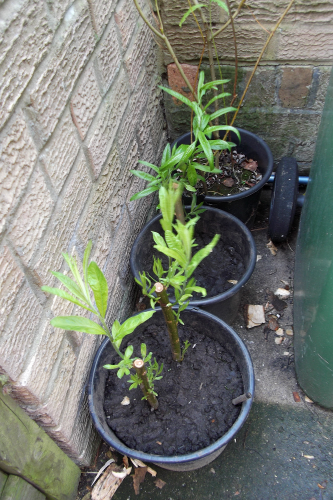 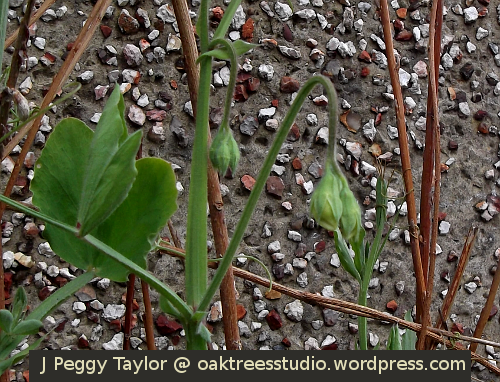 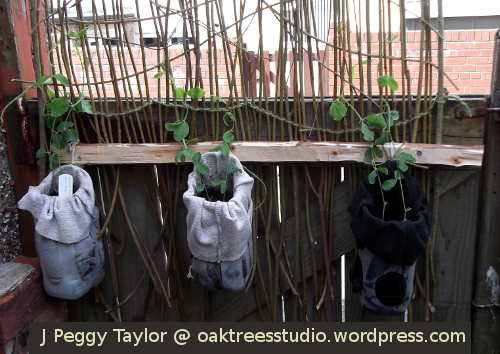 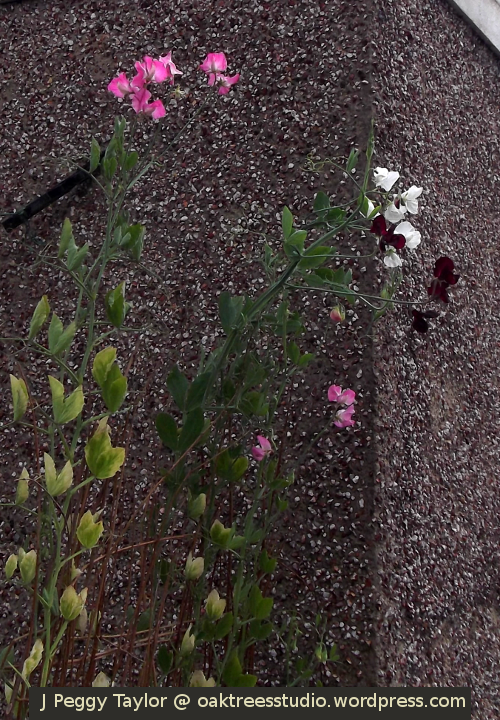 The next stage was to fill my now-fully-prepared air-pruning plant pots with compost and sow my Sweet Pea seeds. 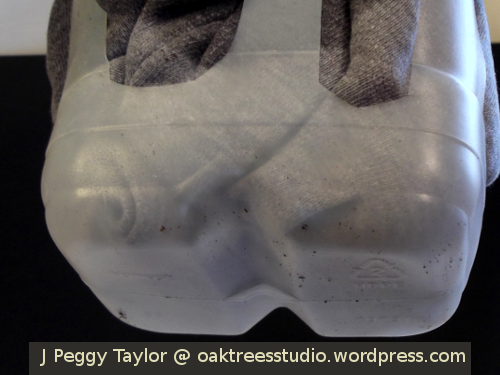 In the process of making my milk carton plant pots I’d cut off a scoop shape from the top of each carton. 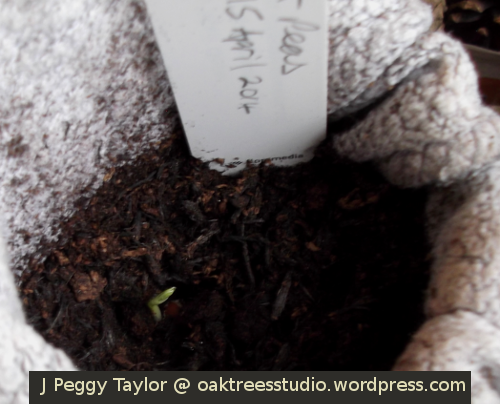 I discovered one of these mini plastic scoops made an ideal assistant for filling the plant pots with compost. 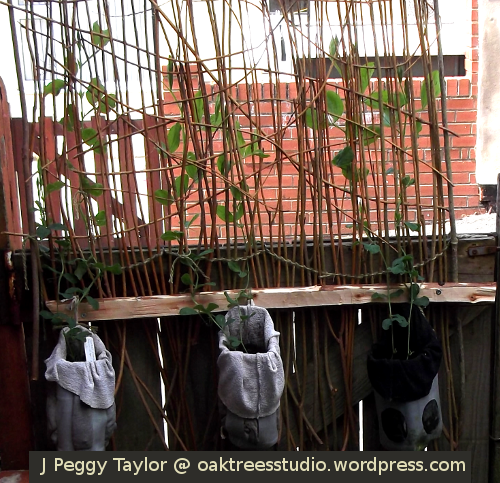 I filled the pots quite close to the top with compost but left enough space to accommodate sufficient watering. 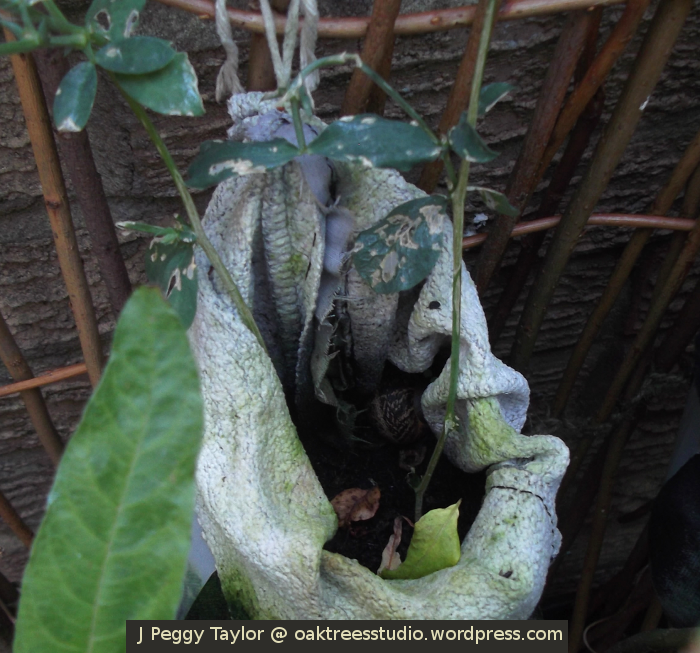 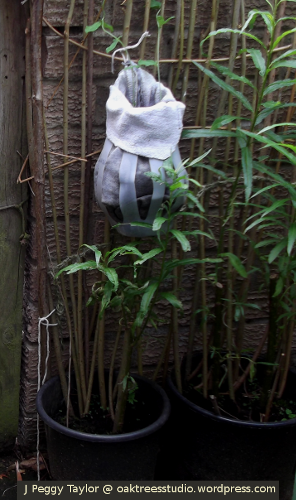 I generally plant seeds into ready-watered compost, so the next job was to carefully water the compost in the fabric grow-bag. 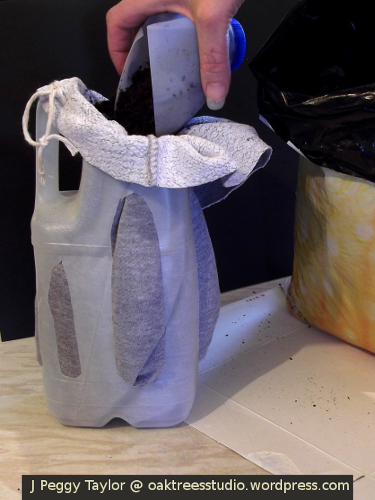 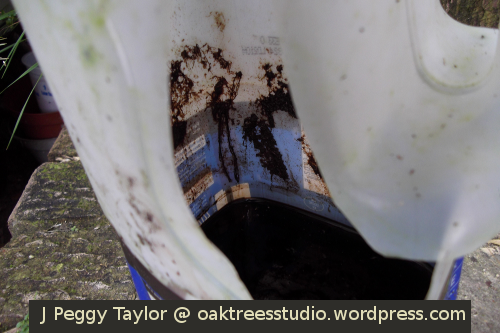 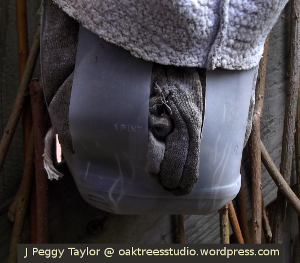 As I was adding the water, I was also watching to see how the water soaked through the compost and out into the fabric grow-bag. 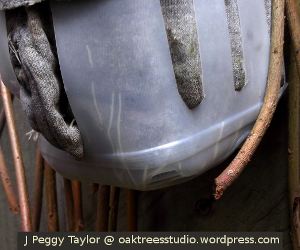 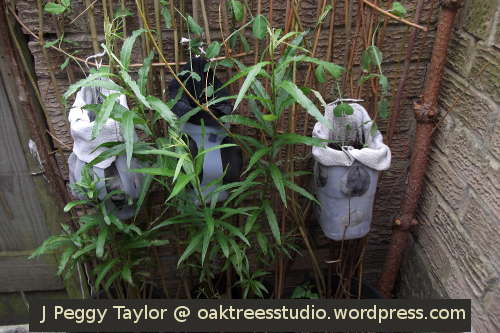 When I’d prepared the air-pruning plant pots I hadn’t made drainage holes in the base of the pots as I felt there was plenty of opportunity for evaporation through the sides of these smaller-sized air-pruning pots. 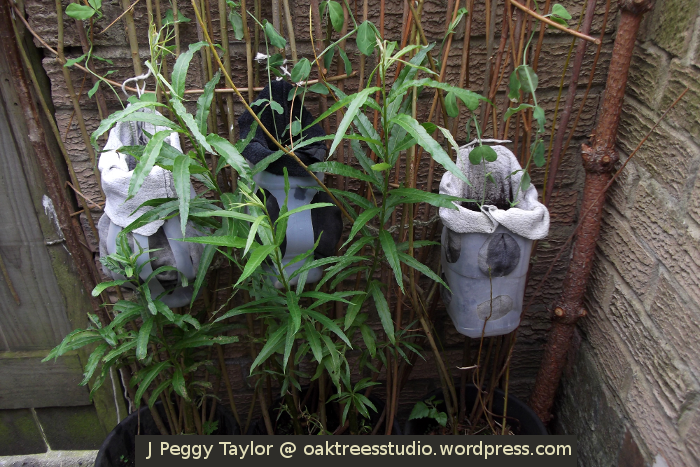 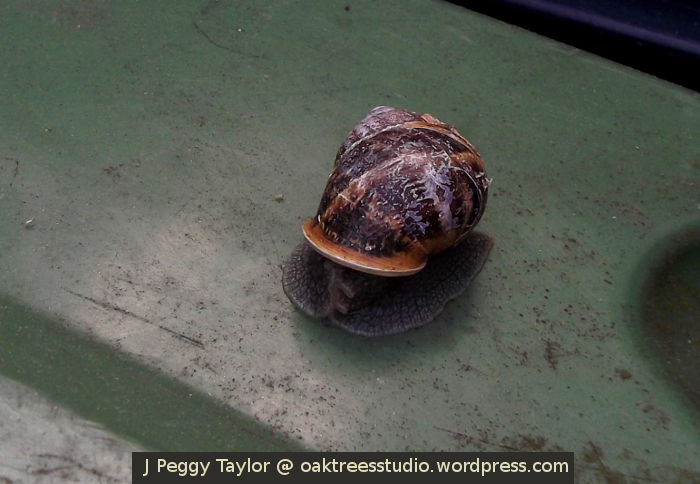 I’d left about 2.5cm /1 inch intact around the bottom of the plant pots too, to catch the water if I did happen to water them too enthusiastically! 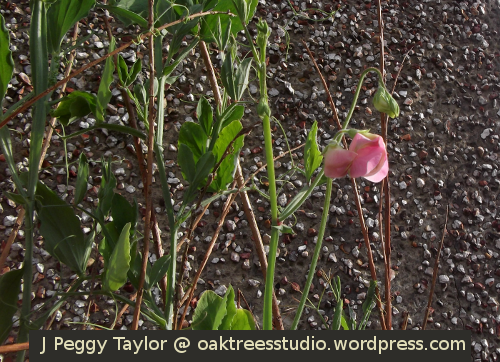 Now it was time to sow the Sweet Pea seeds. 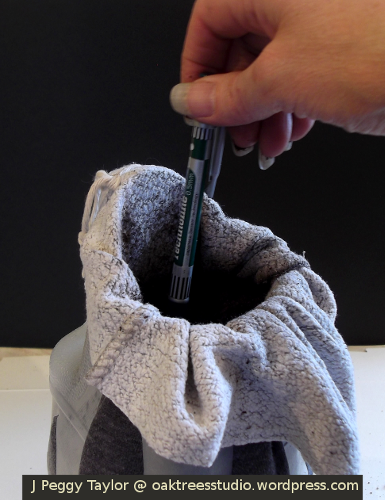 Sweet Pea seeds are quite large, as seeds go, so for this task I used my ‘old pen’ dibber to make the holes in the compost about 1.5cm / half inch deep. 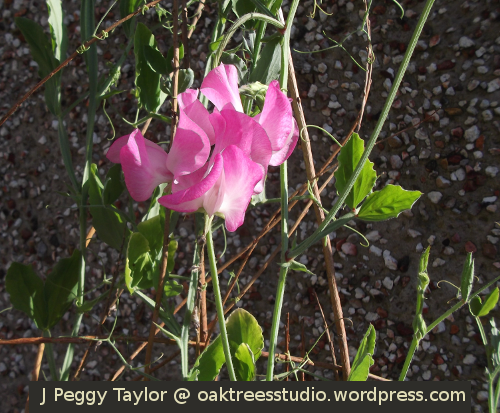 I decided to sow two Sweet Peas in each pot. 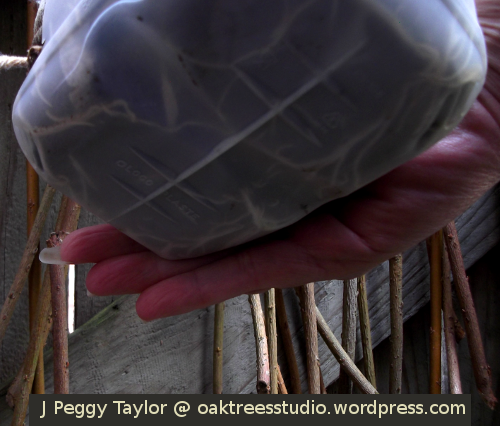 Then after sowing the seeds I used the dibber to cover them over with compost before adding a final drop of water to help the seeds on their way. 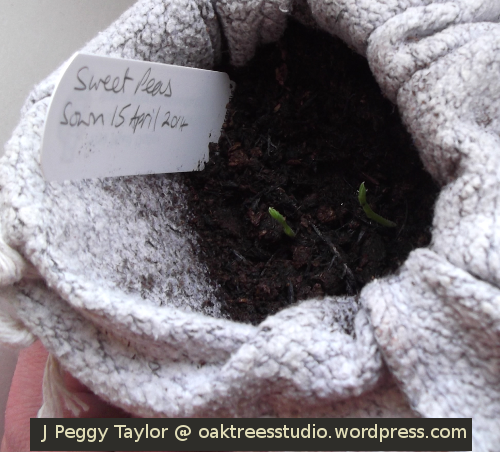 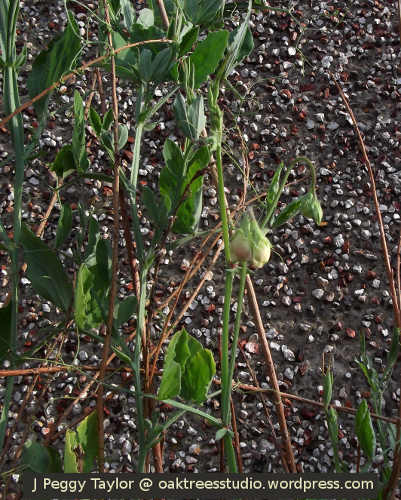 I’m pleased to say that all of the Sweet Peas have now germinated and the seedlings are looking healthy. 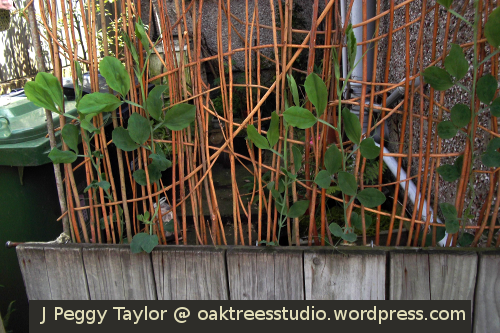 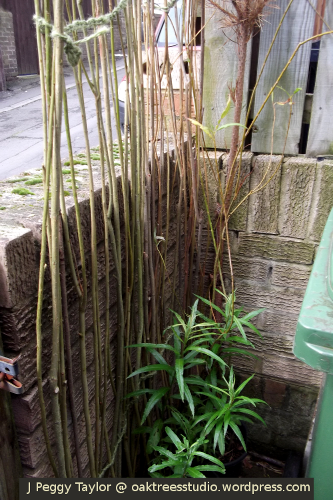 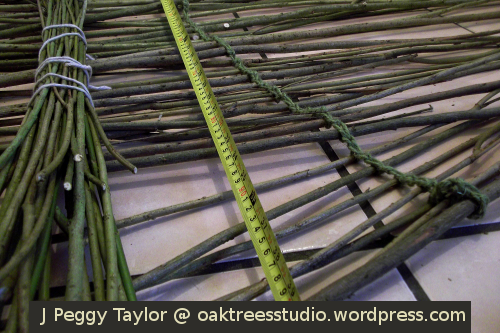 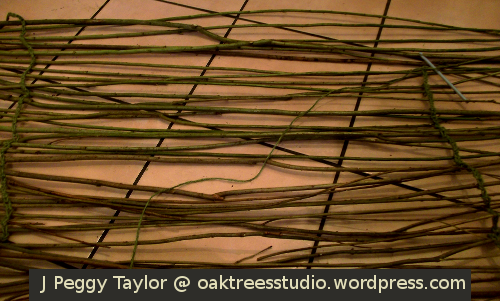 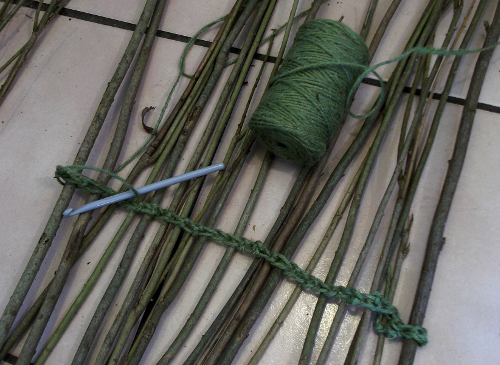 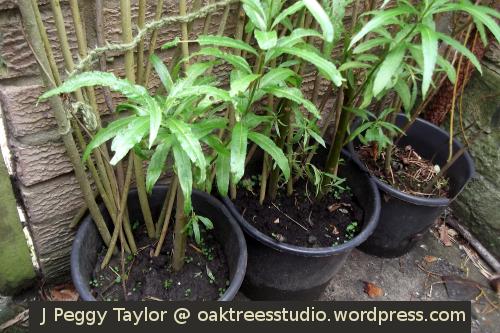 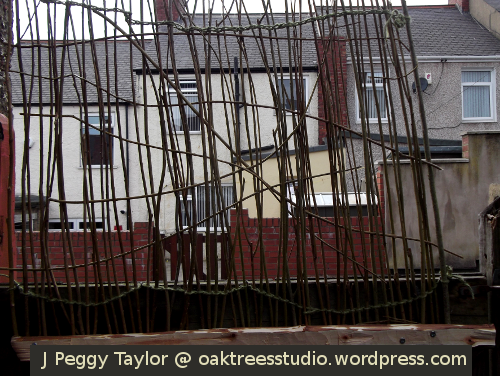 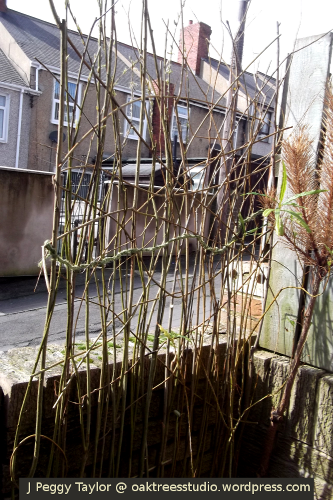 Now I must get working on completing my crochet jute and willow garden screens ready to support the Sweet Pea plants in my back yard … hopefully I’ll be posting more on that very soon.